Village of Secrets, by Caroline Moorehead. Harper. 2014. As Israel celebrates its 70th anniversary, Village of Secrets is a tribute to the Righteous Among the Nations, the non-Jews who risked their lives to rescue Jews during the Holocaust. This honorary title has also been awarded to two entire villages. In Village of Secrets Caroline Moorehead tells the story of one of them, Le Chambon-sur-Lignon, located on a plateau whose population consisted mainly of Protestants. The remote mountainous location, poor transportation, no tradition of talking, and the tacit support of adjacent hamlets served to the villagers’ advantage. Not one refugee was betrayed. 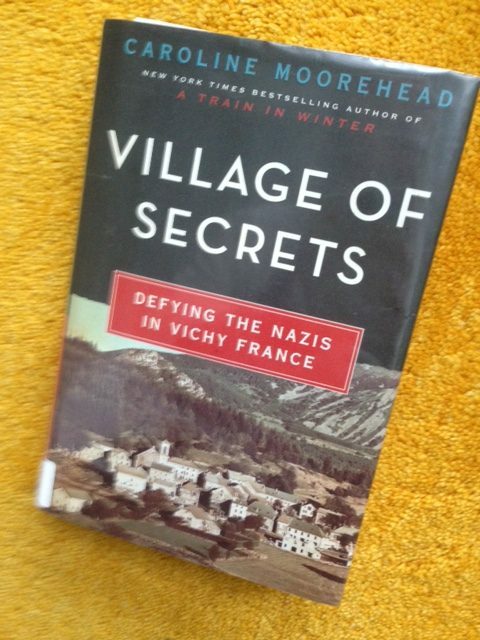 Village of Secrets is also a portrait of wartime attitudes toward the Holocaust by France, Europe, the world. The reluctance to take in Jews from Nazi-occupied territories made them hostages and victims. American laws remained so stringent that only 1,100 people were admitted from Europe during WWII. The largest group was 50 Jewish children brought over from Vienna, Austria, in 1939 by a couple from Philadelphia. Compare this to England: it admitted 10,000 children in less than a year through the Kindertransport. Yet, it cut off entry to Palestine so as not to anger the Arabs. Spain accepted French refugees who made it over the mountains. “In Denmark, ordinary Danes transported 7,200 of the country’s 8,000 Jews to Sweden in a daring fishing boat operation.” While Hitler’s ally Italy ignored anti-Jewish orders, neutral Switzerland kept its long border with France locked. Half of the influx came from illegal smuggler-enabled crossings. But “no other European country had taken such a clear anti-Semitic line” as the French Nazi-aligned Vichy government. It facilitated deportations and confiscation of Jewish property, restricted shopping hours, forbade Jews to use public phones and attend movies, and allowed them to travel only in the last train carriage. The fact that many French Jews survived the war, 8 to 10 thousands of them children, was due, in large degree, to the actions of ordinary French citizens: neighbors, pastors, “telephone operators who warned of raids,” clerks who stamped fake ration cards, policemen who turned a blind eye. Protestant clergy and various charities worked to improve conditions in internment camps and to spirit out children. To find sanctuary for them, they circulated a leaflet with the words “you will not get the children.” Scouts, convents, private families, isolated villages like Le Chambon-sur-Lignon responded. While the Vichy zone was unoccupied, the Jewish organizations had performed miracles to secure several hundred exit visas for children. The Czech consul issued visas, legal and false, until he was put under house arrest. Varian Fry from the Emergency Rescue Committee, organized passage, legal and illegal, for over 2,000 people to Spain, from there to Portugal then to China, Belgian Congo or Mexico. And What Would You Have Done? Post war, thousands of collaborators were tried, convicted, executed. Amnesties followed. 3% of French Jews survived the concentration camps. The tragedy was the fault of the Nazi and of the victims themselves. 20 years passed before the country acknowledged its role in the Holocaust. When you read Village of Secrets: Defying the Nazis in Vichy France you will keep asking yourself: What would I have done?